Steven Chu, a Nobel Prize winner in physics, and former U.S. Secretary of Energy, delivers the Keeley Lecture on Environmental Policy, Saturday, Feb. 27. 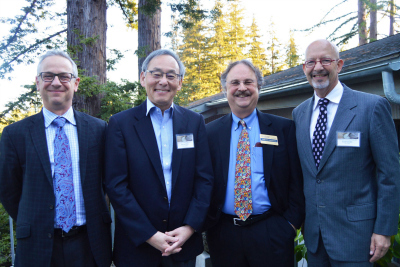 From left, Dean Paul Koch, physical and biolgical sciences, a conference co-sponsor, Steven Chu, Sheldon Kamieniecki, and Fred Keeley, the former state Assemblymember who founded and supports the Keeley lecture. Expect the unexpected was a key message from UC Santa Cruz’s third annual climate science and policy conference, hosted by the divisions of social sciences and physical and biological sciences Feb. 26 and 27. 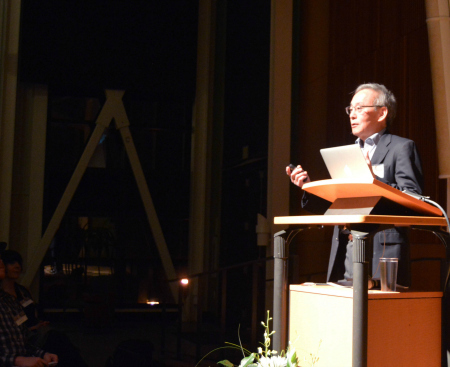 “We don’t know what the world is going to do,” said Nobel Prize winner Steven Chu in his keynote lecture Saturday on energy, climate change, and the transition to a sustainable world. Chu, who served as secretary of energy under President Obama from 2009-2013, is now a professor of physics and molecular and cellular physiology at Stanford University. Chu was joined by a distinguished group of climate experts and policymakers from across the country who gathered to discuss the challenges in preparing for earth’s continued changing climate. The event opened Friday evening with a keynote address by atmospheric scientist Ken Caldeira and culminated with Chu’s Fred Keeley Lecture on Environmental Policy. The conference also included three panel discussions that explored climate change through the perspectives of public health and infectious diseases, geoengineering, and geopolitics. On a macro level, Chu discussed the importance of energy trends in oil and natural gas, as well as alternatives such as wind and solar. He argued that science and technology can make clean energy an even more affordable option. But 100 percent of renewable energy will require carbon recycling, he argued. “Nature doesn’t reveal all her secrets to you,” said Caldeira, whose work investigates how climate, carbon, and energy systems interact. He reflected on how he altered seawater chemistry to study impact of acidification on coral reef growth. “How do you get from correlation to causation?” Caldeira asked. “Scientists aren’t allowed to fail anymore. Each time you fail, you learn something,” he added, saying that if research can reduce every degree of uncertainty that should be considered a success, not a failure. Jenny Reardon, professor of sociology and founder of the Science and Justice Research Center at UCSC, moderated the Saturday morning panel on public health. Panelists included Melinda R. Weathers (Clemson University), A. Marm Kilpatrick (UC Santa Cruz), Daniel Brooks, (University of Nebraska) and Mercedes Pascual (University of Chicago). Emerging diseases are a predictable result of climate change, but with unpredictable results, panelists said. “The planet is going to do a lot of unexpected things,” said Brooks. He added that there are health issues still unknown, and they will show up. “Climate change is neglected in the health agenda,” added Pascual. The panel agreed there needs to be more funding to investigate public health issues and risks. Research needs to make certain what some uncertainties will be. 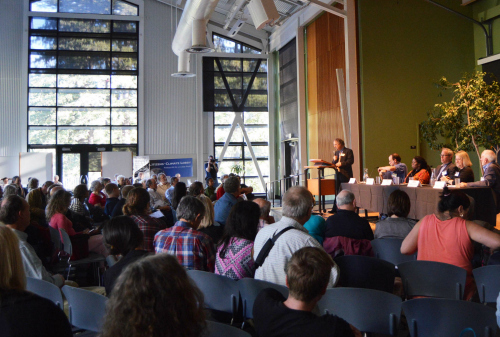 Slawek Tulaczyk, professor of Earth and planetary sciences at UCSC, served as the moderator on the panel on geoengineering, the idea that the climate can be cooled through deliberate intervention. Waleed Abdalati (University of Colorado, Boulder), Jeffrey Kiehl (National Center for Atmospheric Research), Michael Kraft (University of Wisconsin), and Alan Robock (Rutgers University), approached the idea of geoengineering with hesitation. “Geoengineering does not go to the root cause of the problem,” said Kiehl. Geoengineering should not be considered a quick fix but instead a measure of last resort, said Kraft. “There is a danger in taking a technical solution that requires no behavioral change,” he added. Ronnie D. Lipschutz, professor of politics and provost of College Eight, moderated the final panel of the day. Jacqueline Patterson (NAACP Climate Gap Initiative), Steven Lamy (University of Southern California), Diana Liverman (University of Arizona), and Stacy VanDeveer (University of New Hampshire), discussed the major economic, political, and social issues related to climate change, especially the considerations of environmental justice. With climate change posing many unpredictable problems, all panels agreed more action needs to be taken by individuals and decision makers. Climate change needs to be addressed as a personal problem as well as a global one, with real life consequences identified.